At Orthopaedic Associates, our surgeons have the training and expertise to treat all types of conditions related to the neck and back. We use state-of-the-art technology and surgical methods to treat degenerative disc disease, spinal trauma, sports-related injuries, spinal deformities, infection, and tumors. 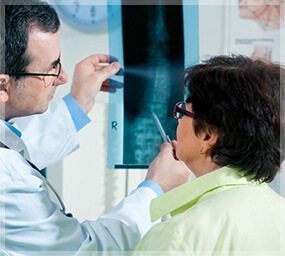 An X-ray, MRI, and physical examination may be used to pinpoint the cause of spinal pain. Orthopaedic Associates provides comprehensive evaluation and treatment of spinal conditions using non-operative approaches as well as surgical options. Our specialist in non-operative spine care provides the most technologically advanced treatment options including fluoroscopic-guided joint injections and other minimally invasive procedures. Our goal is to improve the alignment of your spine, relieve pressure and pain, and prevent further injuries. For most patients, spine surgery is only necessary when more conservative treatment options have failed. At Orthopaedic Associates, our goal is maximum recovery of spine function, and we provide a comprehensive treatment program that includes diligent follow-up care after surgery and a total rehabilitation program to help get you back to your favorite activities as soon as possible! Orthopaedic Associates, Inc. is located in Westlake and Avon, Ohio. For an appointment, please call (440) 892-1440 or (866) 362-7624.